Learn to Eat (LTE) was originally developed in connection with tube-weaning as a pre or post weaning program. Since then this program has been continually developed and extended. Now there are people at NoTube who only book this program or who come to us specifically for it. 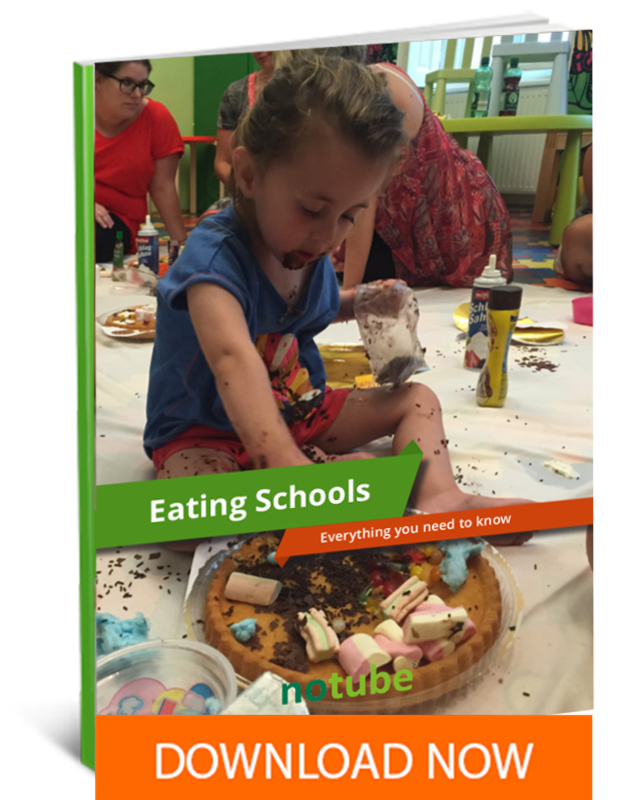 In this blog article we will introduce you to the Learn to Eat Program so that you have a general overview of this NoTube program. Once you have read this blog article, you will know if the LTE-Program is suitable for you and your child. Stabilization and Parental support after the tube wean: Unfortunately even when a child has successfully completed a tube wean with NoTube, not all the problems will be resolved. It might be that a child only drinks; it can happen that a child will only eat a few specific foods; sometimes a child won’t or can’t sit down to eat meals, or a child behaves extremely badly when eating. During the Learn to Eat program we will analyze and detail the problems in all these cases together with you. We will ask you several questions: Has your child ever eaten other foods than it does currently? Has your child ever eaten anything crunchy? Has your child ever chewed meat? Does your child like sweet or savory? All these questions make the therapy possible. The aims for the program will be based on the answers to these questions. It may be that a child doesn’t know any food other than the tube feed and only drinks liquid foods. Then this child must first get in contact with smells and tastes. Afterwards your child may extend its range of foods and try new ones. These steps are not always easy. On the one hand the child has to allow changes to happen, and on the other the parents should reduce their expectancies on the child. Assistance may will be offered in many small steps and these are based on our experts’ knowledg e gained from a rich treasure trove of experience and their various qualifications. It can be just as important to try a new consistency. A child that maybe learnt to sustain itself with liquids during a tube wean, should now eat purees or even solid foods. This means how to chew, swallow, and what to do with the food in their mouths and much more. All of these factors speed up or hinder the path to “normal” eating. This is where a consultation can provide help. Gently offering something new; only changing one thing; not being impatient; happily accompanying the child on their journey – we advise you individually on these things and in many other areas too. We respond to the child’s and their family’s particular situation, and of course we take the mutually agreed aims into account. LTE is also a program for children who don’t have a feeding tube. Many things can play a role with thesechildren. With these clients, it is about children who have difficulties with eating. They don’t like the taste, they don’t want what the doctor, nurse or even the parents have chosen. Sometimes they also have a problem eating the food: chewing and/or swallowing can cause concern or the child has a perception or sensory disorder, which makes it impossible to eat in the accustomed way. It could also be that the parent’s requests differ from the child’s wishes: for example, a child does not want to sit at the table and the eating problem escalates, the parents are distraught and usually the child is too. Children are often strictly “fed”! The mother or care-provider feeds the child before the others eat. The CHILD SENSES the special situation, the pressure and also the boredom that results from the tube feeding routine, and refuses to eat. Instead of changing something the situation becomes entrenched, sometimes the child is forced to eat. This is when advice and suggestions are urgently needed and these are given during the LTE-program. Often a child will only eat when it is distracted and can’t eat unless they have their tablet or a certain film is played. This can drive the family crazy, especially when the family rejects such eating habits due to ideological reasons. Furthermore it’s not recommended in a lot of eating schools advising for a c hange in eating habits. In the specific case of the transition from enteral to oral feeding this behavior might be okay. We found that it lasts mostly only a certain period. Some children only eat certain foods. These children are called “picky eaters” and we are preparing a specific E-Book on this topic that will soon be available online. Picky Eaters need special help, above all because most advice given by wonderful and competent institutions such as Zero to Three or the Harvard Medical School is only relevant when the child has been a Picky Eat since their early development. The extended LTE-Program for Picky Eaters offers an individualized therapy approach compared to these other programs. The child isn’t gaining weight as they should, and parents and children are then sometimes threatened with the placing of a nasogastric or a PEG feeding tube. Parents are told that their child can become stupid if they don’t eat enough. That is not strictly true. The data that could support this theory are based on areas of famine and show that even hunger does not have the same effect on every child and at every age. But you have to deal with it and help the child. It requires the individualized therapy and advice that is offered during the LTE-program. The same is also true for children who drink poorly or, according to the doctors, not enough. When a child has choked and then no longer wants to eat, LTE can help to re-establish the path to eating. The “Learn to Eat” program is a consultation service that can be used on a monthly basis. The success of the LTE program is measured by the parents‘ satisfaction and the progress of the child.